my fair lady — halthegal. "the language of a lady." faerie tale feet painting inspired by bernard shaw’s pygmalion and alan jay lerner & frederick loewe’s my fair lady. shaw’s dialogue is quick and witty, and full of language puns and jokes and just all-around classic interactions between his characters. he wrote the play in just three months back in 1912, the first english production of the play was in april of 1914, and not until march 15, 1956 did the musical version appear on broadway starring none other than a 21 year-old julie andrews and the indefatigable rex harrison. HIGGINS Remember that you are a human being with a soul and the divine gift of articulate speech: that your native language is the language of Shakespear and Milton and The Bible; and don’t sit there crooning like a bilious pigeon. i’ll show you a few pictures of my research and painting process, and then below i’ll share what all of the background icons allude to from the text! enJOY! 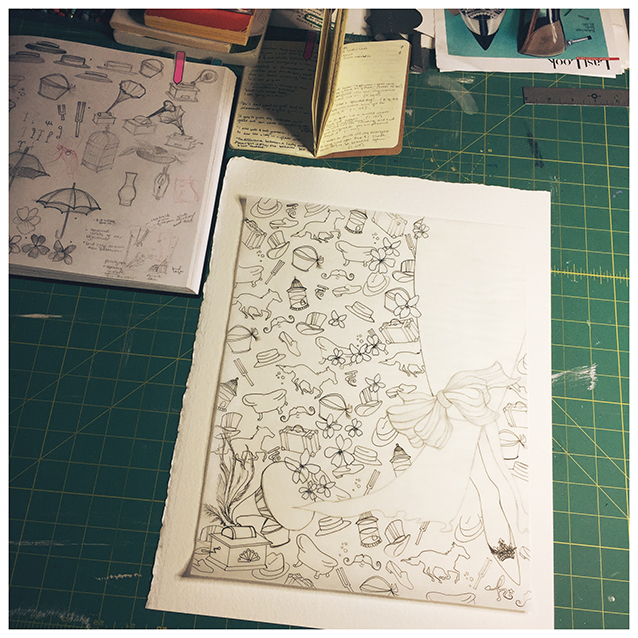 here’s the pattern drawing created from story icon sketches in my sketchbook! i paint at home, surrounded by my books. so here’s my little corner of the world, you can see my paper paint palettes (great for re-using spots of color), my tins full of gouache, and the original pattern drawing on tracing paper. i always save the feet and shoes for last when working on a piece. it just seems fitting for the whole “faerie tale feet” concept. 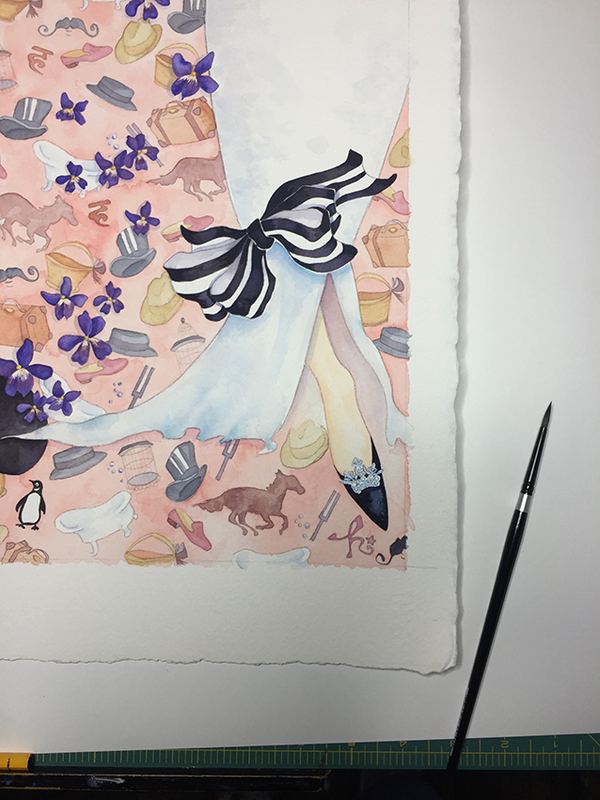 so here’s a mostly finished background painting while about to nervously begin the leg and fancy shoe of miss eliza doolittle…. ta*da! the magnifying lamp i use to paint gives me seemingly endless potential for painting tiny tiny spaces. so the jewels on her shoe turned out rawther well, i dare say… but the bow is still my favourite part of this piece, i think! another piece of trivia you may be wondering about is why if the broadway and london stage production was such a hit, why julie andrews wasn’t used in the film. well, the hollywood producers didn’t think her name had enough marquee punch to it, so they cast a well-known actress instead, a miss audrey hepburn (whose singing voice was dubbed). which, i will forgive them, because in 1964 (the same year), a mr. walt disney made a super star out of julie andrews with a little film called “mary poppins.” i’m glad we have both even if i do wish there was a recording of julie andrews in this role outside of just the cast album. okay, if you’ve made it this far, you may be interested to know that you CAN indeed purchase prints and cards of this piece on the halthegal etsy shoppe. collect the limited edition signed print HERE. & matching cards available HERE.